I decided to do a little casting today before it gets too hot outside. I wanted to try out my newly purchased Hard Ball ingots from Rotometals as well as my latest Lee 255 grain .452" round nose flat point dual cavity mold. To round things out I also ran a few 158 grain Semi Wad Cutter .357" bullets. It didn't take long before the 10 pound lead furnace had the two ingots that I wanted to run melted down into liquid form, about 20 minutes or so for those clock watchers out there. I laid the two molds over the top of the furnace once the ingots had gone down into the pot so they could warm up a bit. After running a couple of passes in each one they were throwing out nice shiny bullets so I ran the pot down to almost empty. At that point I poured all the sprues back in the pot as well as the stub of the one ingot that didn't get run through the first time around. 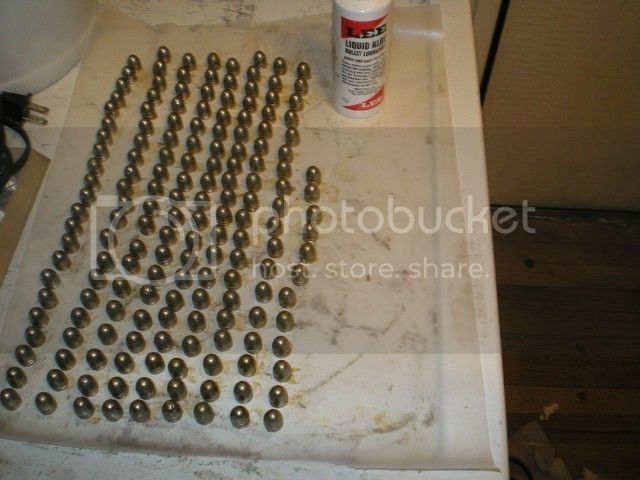 I picked through the box of freshly cast bullets and picked out a few that were obviously not going to make the cut and with all of that in the pot, I stirred things up, fluxed it once again and started pouring one more time. After the pot got low again I just dropped all the sprues back in and unplugged the pot calling it good to go. Putting everything away, the furnace, two molds with a fresh pour in each and the mixing spoon, all items that were still on the warm side got set atop the washing machine to cool off. I brought in everything else and put it up and then snapped a shot of my labor for the brief casting effort. All in all, I may have spent about an hour and a half. Getting a nice cold brown bottle, I retired to the man cave and prepared this little missive. Once these get nice and cool I will pour them into the large plastic bowl that I use for Bullet Lubing. With a generous dose of Liquid Alox poured over all of them I will spin them around to get a generous coating over them all. 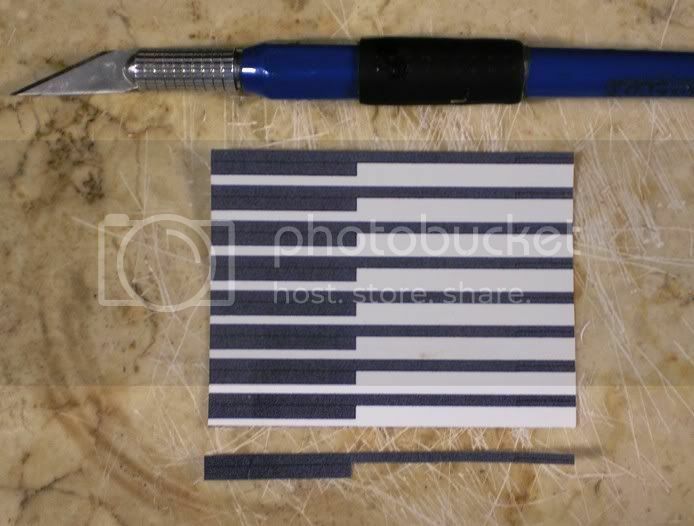 Placing them out on a sheet of waxed paper overnight will let the Alox have a chance to set up and get hard. I have a bunch of plastic cans that I save from Store Bought Prepared Cake Frosting, these are where I store my cast up, lubed up ready to load bullets. Writing down what they are on the white plastic exterior with a Magic Marker makes for easy identification later on. I can always wipe that writing off with a shot of Rubbing Alcohol on a rag for reuse later. At the moment I don't have any empty brass, I have to go do some shooting to free some up I suppose. After doing a posting on my Ruger New Model Blackhawks our leader Captain Kirk mentioned that I should do a thread on the Hombre series from Uberti since I owned one of them. The title of the thread is the full name of the Hombre revolver as listed in the Bass Pro Website. Uberti also makes a number of other Colt SAA Clones in color case hardened frames as well as nickel finishes and they even make a 1890 Remington Outlaw version. They also make a number of other very nice firearms from this period including a number of rifles and even shotguns. But getting back to the Hombre series. It is a pretty faithful representation of the original Colt SAA with the major exception being the finish, it is a matte black although it is called out in the Bass Pro Website as dark blue. There is a brass trigger guard and back strap to offer a little bright color to the otherwise drab appearance. It weighs in at 2.5 pounds, with the short 4 and 3/4 inch long barrel is very nicely balanced and comes in .45 Colt caliber. It can also be had in .357 Magnum as well. The only ones that I have ever seen at the local Bass Pro Shop are the .45 Colt caliber. Personally all I have ever fed it are "Cowboy Action Shooting" type loads, read that as relatively low pressure types. While you could get away with feeding it a few higher pressure type loads such as the standard Remington and Winchester Factory loads, I prefer not to. Even at the low end of pressure and velocity levels, big fat .452" slugs in the 230 to 250 grain class moving out at 700 to 750 fps are something not to be trifled with. These revolvers made their reputations with similar black powder pressure and velocity levels and as such will do quite nicely. I will reserve Ruger .45 Colt revolvers for exploring the upper limits of the .45 Colt realm. Colt SAA models and clones thereof are not really designed to handle a steady diet of things like that. They will handle a few but in the end you will be looking at shooting your revolver loose and risking parts seeking other parts than the ones that they were originally joined to. As a dull finished utility revolver it is actually pretty decent to ride the range with. It is pretty accurate, I can group five shots into 2 to 2 and 1/2 inch groups at 25 yards with mine. I have popped a couple of yodel dogs that had the temerity to come close enough for me to feel comfortable in taking an off hand shot at them. The big 252 grain slug that I favor, a round nosed flat point dropped the offending critters in their tracks with one shot to the brain pan. I also had occasion to take one of those smelly black and white kitties as well. I was out and about with my Metal Detector and he came wandering down the trail as I was wandering up. As he was stomping his front paws and working his way around to aim his or her business end my way I drew and fired taking the top of it's gourd right away ending the confrontation right there. 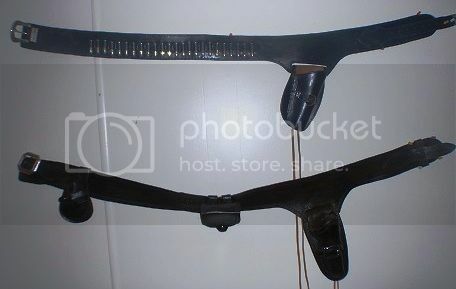 I have made up a couple of different gun belt and holster combinations for it, the current favorite being a cartridge belt with room for 24 cartridges and a holster angled to my liking. While some may accuse me of trying for the Movie Cowboy look, it is actually quite comfortable to wear for a day of wandering out and about. 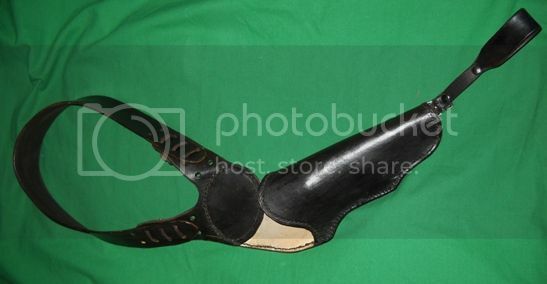 I also have a pancake style holster that carries it high and tight on my right hip. As I like making leather stuff, these are all made up here at home so cost isn't a problem. Trying to finance such things with the way prices are now might make them beyond my reach. But since I do the Home Brew thing, I can get away with my own ideas about these things. 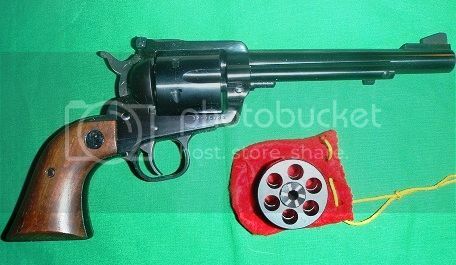 While I would love to have something with a rampant Colt engraved on the grips or frame at the moment the closest I can come to that is with my Ruger New Model Blackhawks in .357 Magnum. I also have a Uberti Hombre in the more traditional .45 Colt caliber but being an Hombre with it's matte black finish it doesn't even look like a Colt with the Color Case Hardened frame and parts and that drop dead gorgeous blue finish. The Ruger New Model Blackhawks are a tried and true design that most everyone is familiar with. Using their transfer bar ignition system allowing for filling the cylinder up safely with 6 rounds, adjustable sights as on the New Frontier Model Colts and in the case of both of mine, nice wood grips, they have a lot going for them. The 4 and 5/8" barrel version came to me free. A buddy who is involved in the Veteran's Organization that helped get me into my current mobile home and also lives in the same park had a room mate who was an older gentleman. 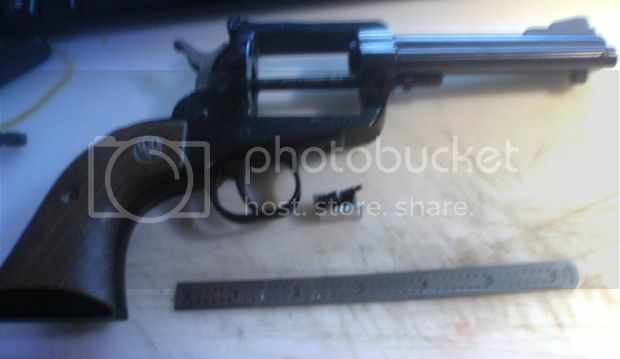 He passed away and among all the stuff that was left behind was this Ruger New Model Blackhawk without a cylinder. Lon looked high and low for it all to no avail and not being very interested in what he considered a "partial" firearm he brought it over to me, the only "certifiable" gun nut he knows. I was plumb tickled to get it. 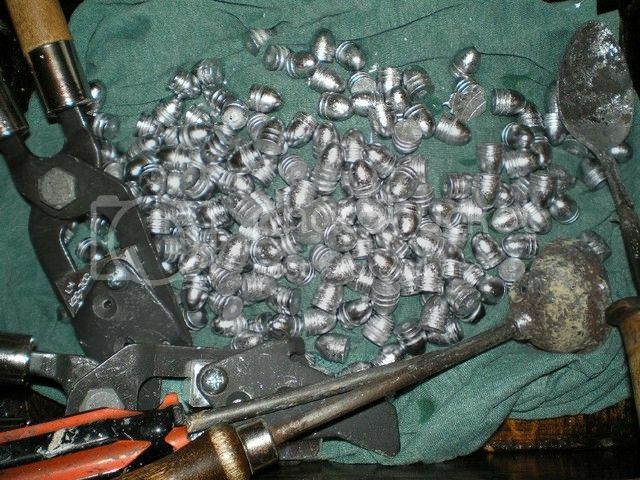 I called the New Hampshire Factory where they assemble and work on these revolvers and asked if it would be possible to fit a new cylinder and replace a couple of minor missing parts, the cylinder pin release spring and nut. They told me to send it to them and they would give me a call back to tell me how much it would be total. I boxed it up in a USPS shipping box, addressed it and enclosed a letter with my name, address, phone number, and all the particulars concerning the revolver. About a week later I got a phone call from a nice young lady who told me that for $175 they would refit a new cylinder and the missing parts, test fire it and ship it back to me. I was rattling off my credit card number so fast she had to have me repeat it for her! While I was waiting for my newly refurbished Ruger to get repaired and returned to me I happened to go up to a little gun shop up in Henderson that I go to for reloading supplies. They have better pricing than most other places on primers and powder in the area and I like to support the little guys, well in this case, gals when I can. After picking up a box of CCI Small Pistol Primers I browsed around the gun cases in the back part of the store where they have the revolvers. The front display cases are mostly all semi autos and the three of those I have are sufficient to my needs. In the furthest back case rested a 6 and1/2" Ruger New Model Blackhawk .357 with a spare 9MM cylinder in a little red cloth bag. It was used, but hardly looked it and the price was right at $300. I asked to look at it, checked it out closely, noticed that while it had been shot some to all intents and purposes, it might as well have been a new revolver. Temptation got the better of me and after filling out the paperwork and giving up the plastic it followed me home. A couple more days later the big green UPS truck rolled up to my place late in the day and the driver was pounding on my door. He had a box marked with a Ruger in big red letters on the side of it. The box was big enough that you could have stuffed a 7 and 1/2 inch barreled revolver in it. Admittedly I was a little curious about that as I signed for my box and took it inside. As soon as the door shut, the Buck was out and I was slicing at the paper tape that sealed the box shut. Inside was my newly refurbished New Model Blackhawk in .357 Magnum with it's 4 and 5/8" barrel. They had stuffed some cardboard and paper inside to absorb the extra space the much larger box had over the size of my short barreled revolver. When I had sent the revolver in the bottom edge of the housing that held the cartridge removal rod and spring had been scrapped clean down to the aluminum by the cylinder retaining rod for a good 1/8" along most of it's length. Careless handling by the previous owner had accomplished that. The factory tech who had refit the new cylinder had taken care of that, it was now a uniform black overall. The missing parts were replaced and the cylinder was just as if it had been the original. I was tickled! So now I had a pair of New Model Blackhawks, okay so one was longer in the barrel than the other, so what. Taking them out to the desert with an assortment of hand loads that I like I soon discovered that they both shot great. At 25 yards they both shot a little high so it was necessary to hold at the bottom of the number 8 ring on the 100 yard small bore rifle targets I was using to put them in the bull. At fifty yards a little higher hold was okay and at 75 they were right on the money. Trying out the 158 grain Semi Wad cutter's with gas checks showed that the 6 and 1/2" barreled on like them best when pushed to about 1350 FPS. The shorter barrel liked them as well but seemed to do a bit better with a Lyman 150 grain semi wad cutter design at almost that speed. The 150 grain version did not have a gas check either. The best groups I was showing with their preferred bullets was hovering right around 1 and 1/2 to 1 and 3/4 inches if I did my part on the other end off a rest. Standing up in the breeze, 2 to 2 and 1/2 inch was the normal grouping off hand. I would like to try a heavier weight with them to see how that goes, I haven't even bothered to try anything but cast lead as it is my preferred bullet material. 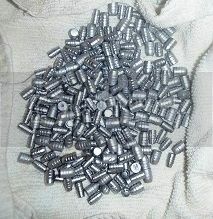 Although it would be interesting to see what they would do with some zippy light weight jacketed hollow points. 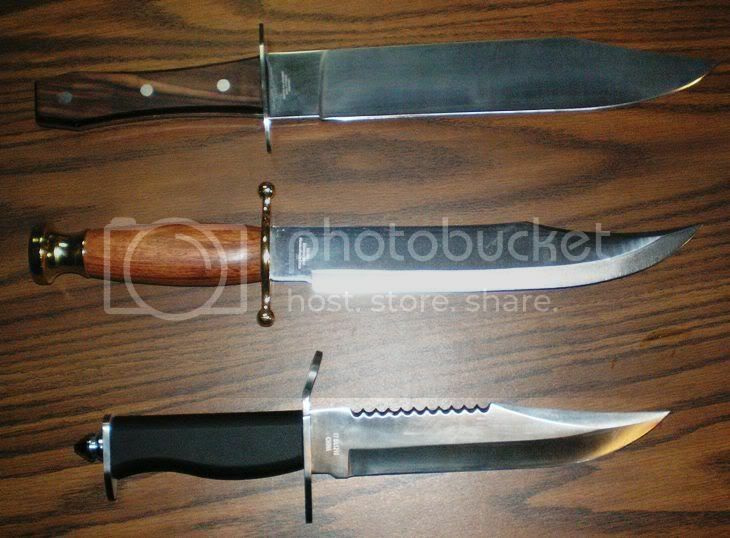 Being of unsound mind, I started collecting edged weapons a long while back. 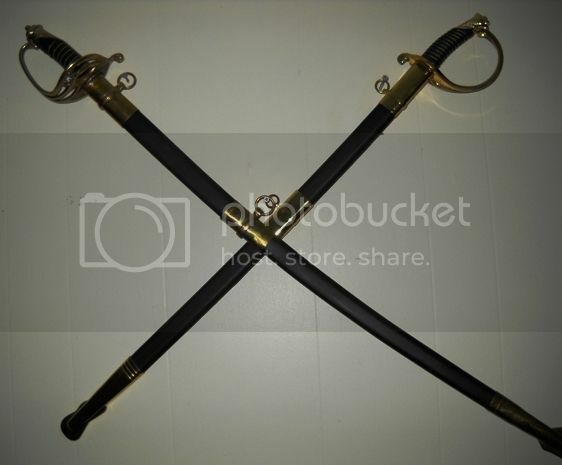 I have a couple of 1860 Light Cavalry Sabers, both are replicas, but they do look the part. I originally got one when I had the urge to go out on Halloween as a Cavalry Trooper. After getting it and hanging it up on the wall after the event, it looked sort of strange hanging by itself so I scored a second one to make the crossed pair. A few Halloweens later, at the request of a lady friend who had discovered an old fancy ball gown and what seemed to be thirty or forty slips to go under it, (I swear that there was lady under there somewhere, but it took a lot of work to find out!) I decided that she needed a Confederate Cavalry Officer to accompany her. 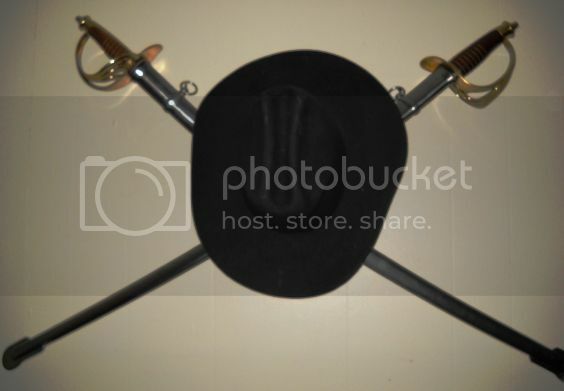 That led to the purchase of this 1858 Light Cavalry Saber. Since one looked sort of funky on the wall, a second earlier version was purchased. I think my favorite knife that I have has to be my Arkansas Toothpick. It is, to say the least, flat out humongous! At over 18 inches from pommel to tip and carrying 13 plus inches of blade, once it comes out it is just hard not to notice! 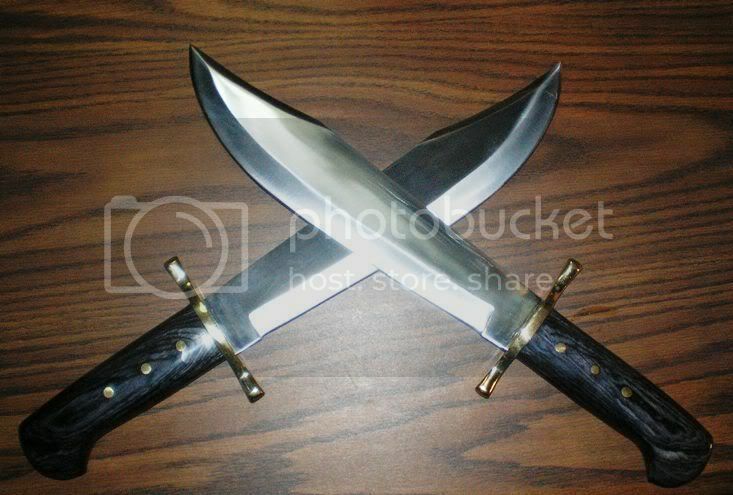 And I really wanted to get something that looked like the old timey scimitar from Aladdin's Tales. While I carry a Buck Lite in my pocket all the time, I think the one blade that I have that gets the most use day to day has to be actually the smallest one. It even gets replaced quite a bit as they do wear out. I dabble in leather on occasion and pretty much go where ever my mind wanders. After watching one too many cowboy shoot'em ups late at night I had an itch to scratch. 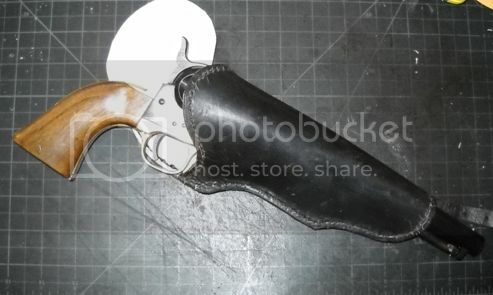 I have a second 1851 Colt Navy now, this one in not historically correct .44 caliber, but a second holster for the opposite side would not be too far out of line, especially since I already have the pattern down. I have long wanted to get a Colt SAA of some sort and when the Bass Pro Shop opened up here in Las Vegas I was pleasantly surprised to find a Uberti Hombre for just under $300. It was in the traditional .45 Colt caliber which just tickled me even more. 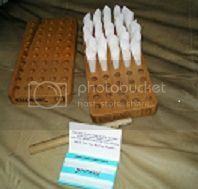 Although I had to purchase a set of dies and shell holder I got the Lee Die set which comes with the needed shell holder in the box. I like to make my own leather up, yes I am a Tandy junkie, the lady that owns the store here knows me on a first name basis as well as my credit card number. I have made a couple of them over the years I have owned the revolver, sold the first one and made a second that I like a lot better. 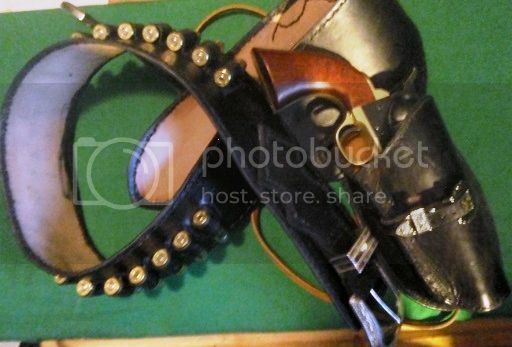 The current Belt and Holster is completely lined, sports 24 cartridge loops and is quite comfortable to wear for the day. I have worn it out and about in the desert when hunting yodel dogs and even took one that had the temerity to get about twenty yards close with the .45. Of course, that made the rest of them shy off for a good while. But being yodel dogs they eventually let their curiosity get the better of them when being serenaded by my dying rabbit call. I also have a Belt and Holster set that I made up for my short barrel Sheriff's model 1858 Remington with Powder Flask holder and bullet pouch. Welcome Wagon / Howdy from the deserts of Nevada! I probably know a bunch of ya'll from the other forum (1858 Remington) so this will be fairly short. 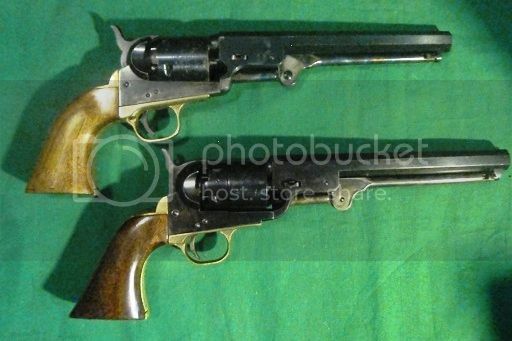 I only currently own two Colt Black Powder revolvers, both of them being the 1851 Navy models, one more realistic than the other. That being the .36 caliber version that I have had the longest, around 20 years or so. I have had it long enough that I have accumulated molds for the round ball .380" and conical bullet, 135 grain, that Lee peddles. I have stitched up a couple of holsters for it and the other one that I own. 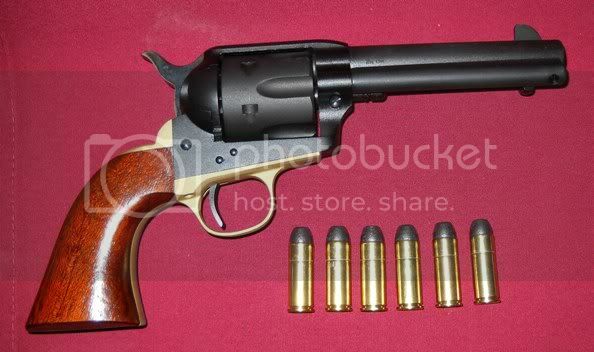 The other one is one of those never was versions with a rebated .44 caliber cylinder and barrel. I scored it for a Benjamen off of one of the other forum guys a while back, it was the proverbial basket case. A couple of people had tried to rebuild it over the years from it's once former glory but never really got there. I cleaned up the metal, sanded and polished it as best I could and then re-blued the whole thing. The once case hardened frame had been sanded down before I got it so I had no choice in the matter. The loading rods, hammer and trigger will still showing a little case hardening so I just left them as was with a little tuning up to make things function nice and smooth. The grips on both of them have been cleaned up and refinished with my favorite handgun grip finish product, Birchwood Casey's Tru-Oil. Once the original finish is stripped off and the wood sanded a bit I start applying Tru-Oil by rubbing it in with my finger tips. It gets to set up for a day or two and then is taken down with some 000 Steel Wool. Doing this repeatedly fills the pores of the wood with the Tru-Oil until you get a nice smooth slick finish. After the last coat has been buffed out lightly with Steel Wool I go over it with Birchwood Casey's Stock Sheen and Conditioner and it is good to go and pretty much proof against my grubby mitts. 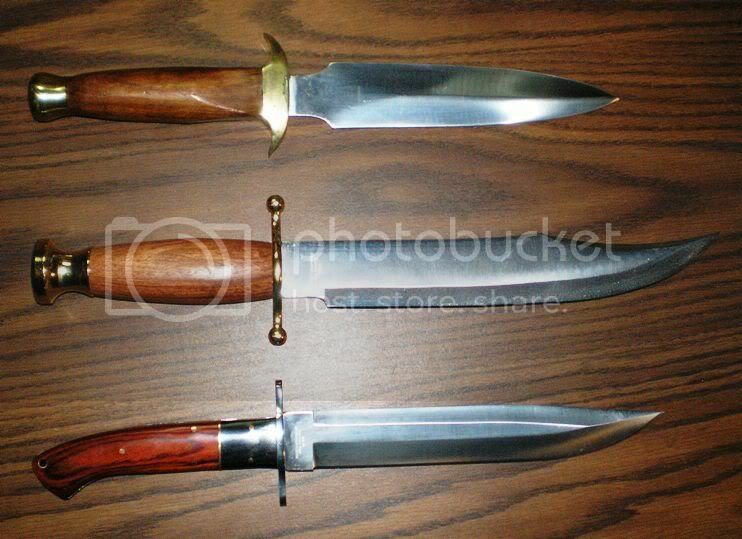 The upper 1851 is the .36 Caliber with the lower being the .44 caliber refinish job. I am looking forward to obtaining an 1860 Army model .44 eventually, steel framed of course. 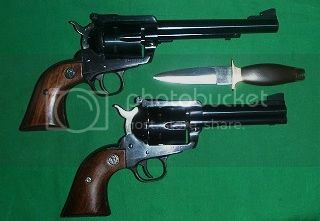 That should round out my Colt Black Powder Revolver collection pretty well. I had a 1849 Well Fargo model a long time ago but it was far too tiny for my paws to really get around. I gave it to my niece who had taken a fancy to it. I have also had an old 1847 Walker model, it was the first black powder revolver that I ever had chain fire on me. After a few years I let a buddy talk me out of that one. I never much cared for it having to tie the loading lever up with some leather to keep it from flopping down when being shot. One day I may take a whack at getting one of the big Dragoon Models if I find one on the cheap or in a trade deal.